There were no champagne bottles opened in celebration at the offices of Craig Kinzer September 9, when it was announced that Russell Investments would leave its longtime headquarters in Tacoma and relocate to Seattle. The occasion would have called for it, for sure. Kinzer, principal of Kinzer Real Estate Services, and his team had worked for three years to find the right space for Russell, the global investment company, and its 900 employees in the Puget Sound region. The team from Kinzer, led by Shelley Gill, totaled four people. With representatives from Seneca Real Estate Group, Sellen Construction Co., architects NBBJ, law firms Davis Wright Tremaine and McCullough Hill PS, plus various appraisers factored in, Kinzer estimates the team ultimately comprised 12 people. "An awful lot of hard work has gone into it," Kinzer says. "That's our job, to put the team together." After 73 years in Tacoma, Russell Investments was lured to downtown Seattle and the former headquarters of Washington Mutual by Seattle's vibrancy as a corporate and cultural center, which would make it easier for the company to hire new talent. But the bottom line was the fire sale on the building. Russell's corporate parent, Northwestern Mutual Life Insurance Co. of Milwaukee, bought the skyscraper for $115 million, less than half of what it had been appraised at in 2008 (Kinzer did not represent Northwestern Mutual in the deal, only Russell). On a square foot basis, the price wasn't much higher than the city of Seattle's storied purchase of the 1-million-square-foot Key Tower for $124 million, for just $124 a square foot, a deal Kinzer also helped negotiate. The Russell deal not only brings Seattle a great global brand, but also 900 smart people and a place for fostering new talent. "This is one of the most intelligent and talented groups of associates you could find in a single company, with relatively high payroll per capita," says Kinzer. The Russell Investments deal is the latest feather in the cap for the 53-year-old Kinzer and his team. 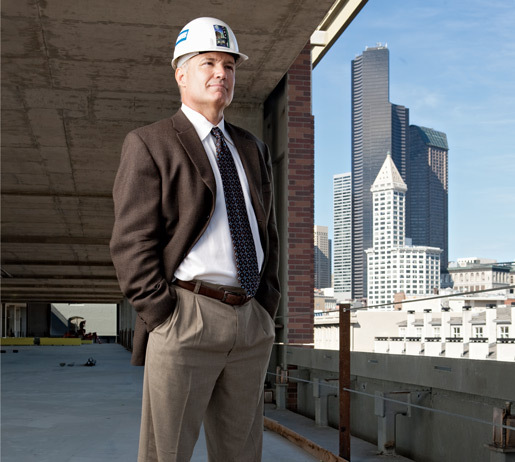 Besides the City of Seattle/Key Tower deal, his firm has been involved in locating the site for the Gates Foundation and most of Starbucks' non-retail facilities, including its headquarters in the old Sears building; assembling 1.6 million developable square feet for the Seattle Children's Research Institute at Children's Hospital; managing site selection and negotiation services for Benaroya Hall, as well as acquisition, eminent domain and relocation services for Safeco Field. Kinzer has a staff of just 10 people, so he relies heavily in each deal on building a team of construction, architectural and legal teams. And traditionally, he does it very quietly. "We've really never marketed ourselves. We worked on the Gates Foundation [project] for two years before anyone knew it was in the market. You have to keep things quiet, confidential and proprietary, and with a large firm, that's hard to do," he says. He's famous for working his people long and hard in the closing days of a deal. "He has a background in law, accounting and business, so he can take a different approach from a lot of brokers," says one competitor, who requested anonymity. "He can take a sizable, complex deal and do a good job of it. Because he is independent, he is able to bring in the best partners to handle it." "He represents the user, not the building owner. And that makes a huge difference," the competitor says. Kinzer, who works in a downtown tower overlooking Puget Sound, studied political science and economics in school. He says microeconomics was his "favorite course of all time," one he always recommends to students "because it touches everything you do in business." He went on to earn a law degree at the University of Washington before completing his MBA. He joined Touche Ross and became a certified public accountant. While doing tax returns for real estate partnerships, he realized he had found his true calling. When he was rebuked for replacing a plastic Christmas tree in Touche Ross' lobby with a real one-the building owners didn't want to risk a fire-Kinzer left the accounting firm and joined his client Jim Norman at the Norman Co., where he helped change the environment to a professional services business, removing individual competition among brokers. But in 1992, Norman fired him in the middle of a downturn, Kinzer's Issaquah home faced foreclosure and he wasn't sure he was going to stay in the brokerage business. When he started getting calls from clients, including Starbucks, he was able both to launch his own business and save his home in the bargain. The commercial real estate market today, Kinzer says, is the worst he's ever seen. He anticipates the market hitting bottom next year when vacancy rates rise to a historic high of 30 percent. Overbuilding, falling demand and tight credit markets have all contributed to this weakness. The drop in prices in the residential market will look mild compared to "what's coming down the path here with billions and billions of commercial real estate debt ready to default," says Kinzer. "It's going to create some chaos. Seattle will be in the thick of it, and the [resulting] transactions will set new benchmarks on the price of buildings and related rents." As leases come up for renewal, Kinzer says tenants are already finding themselves able to rent Class A office space downtown for prices in the low 20s per square foot, down sharply from the mid 40s at the height of the market. In the midst of this churn, the important thing is to focus on strong relationships, Kinzer notes. "Brokers, it seems, spend 50 to 80 percent of their time trying to get clients, because it's very competitive out there, and then spend 20 to 50 percent executing," he explains. "Here, we spend little time trying to find clients and 90 percent of our time executing. Business has just come to us. And once clients come to us, they usually stay. I get to meet with CEOs and CFOs. It's not just another lease; I'm learning a new business. I'm invested in their business, and because we're a partner, we make decisions like a shareholder." "In a sales-driven business, his is a content business," says Scott Wyatt, managing partner at architectural firm NBBJ. "His level of homework and research is like no other."